When asked to make a list of airline jobs, most people instantly think of pilots. But the flight crew, while their jobs are definitely important, are only a small part of what keeps an airplane flying and flight schedules on track. Airlines rely on many individuals to perform their job in order to keep them in business. They include baggage handlers, ticket agents, and avionics technicians. Many airline jobs are well paying and offer prestige as well as excitement and fantastic benefits. Discounted airfare for employee and his or her immediate family on other airlines. Eligibility for most benefits usually begins on the first day of work. Depending on the position, an airline may provide additional benefits such as employee parking and bonuses. Find Your Aviation Industry Job Today! AirlineJobFinder is now 100% free! According to U.S. Department of Labor Bureau of Labor Statistics, Flight crewmembers make up 33 percent of air transportation employment, and include pilots and flight attendants. As the airline industry continues to recover from the affects of 9/11, more airline jobs are becoming available and demand for qualified applicants is increasing. On Airline Job Finder we break down many different kinds of airline careers. Each of the following types of airline jobs is discussed in great detail in our Free Members section. The main responsibility of a flight attendant is to make sure passengers are safe. Next, the must provide great customer service. Flight attendants make up almost 20 percent of the 515,000 employees that comprise the aviation workforce. Do you love to travel? The job might be for you! Every airline, big and small, needs administrative support staff to keep the office running smoothly. These positions include secretaries, data entry workers, receptionists, communications and PR specialists, and those who work in the human resources department who handle or oversee the hiring, labor relations issues, training, and termination of employees. Avionics technicians specialize in working on the electronics systems of aircraft. Avionics technician jobs involve troubleshooting, repairing, replacing, and installing avionics equipment. Calibration of the equipment may also be required. The airline district sales manager oversees all of a district’s reservations and ticket sales offices, and the sales representatives in that district. Sales representatives promote their airline in an effort to sell cargo space and plane tickets. Flight dispatchers are responsible for ensuring the safety of an aircraft’s flight. This includes preparing a flight plan, which is a detailed schedule of destinations, layovers, distance, expected fuel consumption, winds aloft, weather, altitude, compass bearing, and alternate destinations in case of problems. Aviation meteorologists provide weather information to airline flight dispatchers and pilots. They must determine current and forecasted weather conditions for all altitudes, including the direction and speed of wind, cloud cover, and precipitation. Passenger service agents some of the same responsibilities as those in station agent jobs, but they are focused on working passengers – not aircraft. Their duties include issuing refunds to passengers, computing fares, preparing and selling tickets, collecting charges for excess baggage, checking baggage, and providing travel information. An airline ramp planner is responsible for knowing the arrival and departure times for each of the airline’s aircraft at that airport. He or she coordinates a variety of departments or contracted companies that must perform various tasks on the aircraft before it can depart for the next flight. Reservation sales agents provide travel information over the telephone to customers of the airline. Typically, this information includes trip planning, car rentals, seat availability, fare information, schedules, tours, meals, and other information relevant to the customer’s flight plans. Although internet reservations have skyrocketed, airlines still utilize reservation sales agents. Airline crew schedule coordinator are responsible for staffing of aircrew and ground support to keep flights on schedule. If weather or mechanical difficulties delay a flight, it is the crew scheduler’s responsibility to make sure schedule adjustments are made so that travelers arrive at their destination on time. Ticket agents work at an airline’s ticket or baggage counter. They greet customers when they arrive at the airport. They check in luggage and make seat assignments. 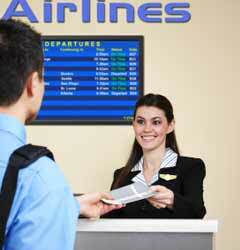 They also handle airline ticket sales, reservation changes, and provide information on aircraft boarding. An airline flight instructor provides recurrent training for the airline’s pilots. Airline flight instructors may be senior pilots who fly for the airline. Aviation attorneys specialize in aviation-related cases in commercial or general aviation for individuals, government agencies, or companies. Aviation attornies represent airlines and/or the government. Some aviation attorneys work for the FAA, while others may be on staff or on retainer by large corporations who own aircraft or deal with airlines. For each type of job profiled in our Members section there’s a description, pay details, and educational requirements. You won’t want to miss our interviews with industry veterans either. Their insights are invaluable.